David Ezra Stein spoke about overcoming creative blocks at the scbwi winter conference this past January and his talk was one of my favorites. 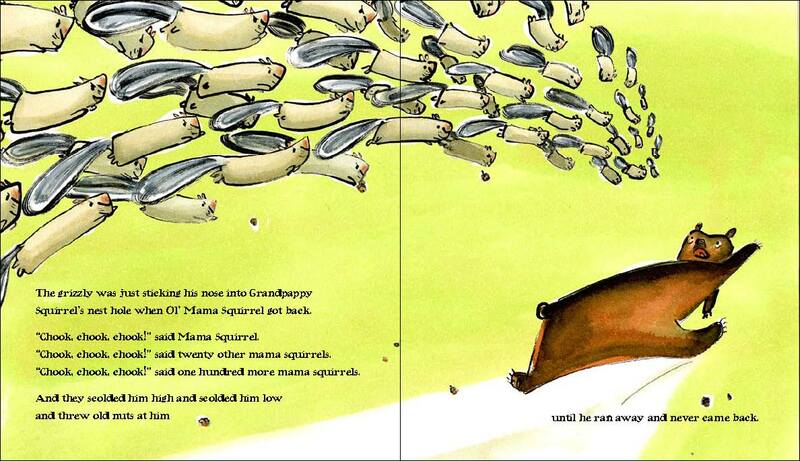 During his presentation, he told us the story behind his latest picture book Ol’ Mama Squirrel. David completed all the final artwork, delivered it to Penguin, and then decided it wasn’t right and asked if he could redo the entire book. I repeat: he completed the final artwork then decided to do the whole. thing. over. I appreciated hearing that even an accomplished, Caldecott award-winning illustrator can hit road blocks sometimes. His gutsy 11th-hour decision to redo the artwork—and Penguin’s gutsy decision to let him do so—is pretty cool. 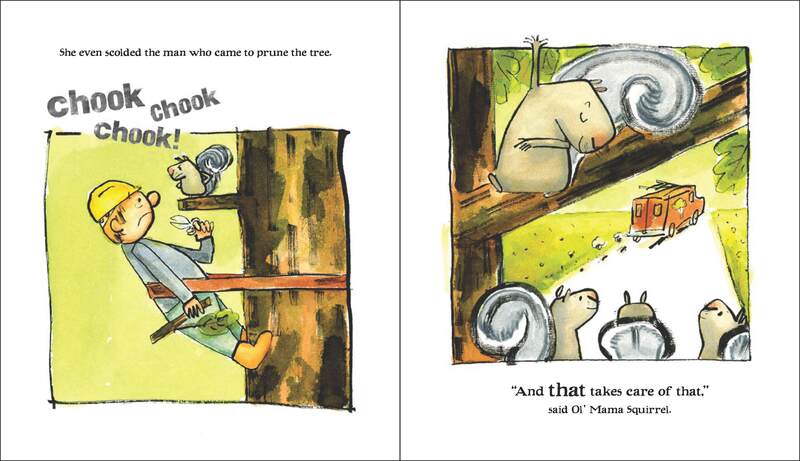 Read on for more about David and the making of Ol’ Mama Squirrel. Tools of the trade: Dr. Martin’s concentrated watercolors and inks, Caran D’Ache Neocolor crayons, Aquarius II watercolor paper, Dr. Martin’s Black Star Ink, Drawing tool = anything you can dip into ink. Illustration idols: So many. Ben Shahn, Henrich Kley, William Steig, Bill Watterson, Sendak, Seuss, Robert McCloskey, Ernest Sheperd, Arnold Lobel, James Marshall, etc. etc. Non-book idols and inspirations: Jim Henson, Matisse, Goya, George Bellows, Rembrandt, Van Gogh’s drawings, Hiroshige, Hokusai, Persian miniatures, New Guinean sculpture, many others, ad infinitum. Caffeine of choice: Genmaicha (smoky green tea). Workspace: Heptagonal studio in my apartment. I have three desks: for writing, “computing,” and drawing. …as a child: Madeline, Babar, Little Bear, Bedtime for Frances, Scrambled Eggs Super, Miss Nelson is Missing, The Hoboken Chicken Emergency, The Prydain Chronicles. …as an adult: Ox-cart Man, Snow, The Snowy Day, Frog and Toad, Harry the Dirty Dog, If You Give a Moose a Muffin, Gaspard, etc. etc. Favorite thing to read: PG Wodehouse novels. 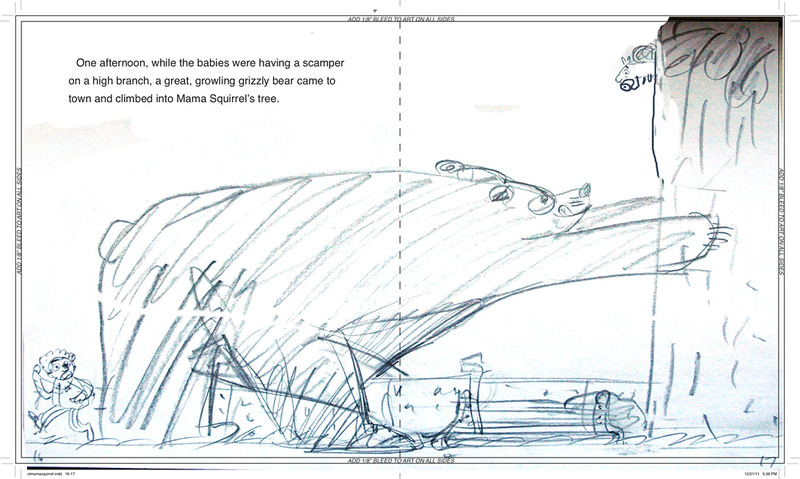 P&O: How did you get the idea for Ol’ Mama Squirrel in the first place? I was working on another book for Penguin about a frog and it just wasn’t working out too well. That whole spring I was trying to make it work. Basically they wanted me to change part of the story and I didn’t want to change it. I was kind of frustrated and just forcing myself to work on that everyday and not really making much headway. Occupy Wall Street was going on at the time so I was listening to the radio and feeling like I should go down to Wall Street. It sounds really exciting; all this stuff is going on, people are organizing… and then I thought about that squirrel again. I thought that tough squirrel is a really interesting character. She was willing to take on anybody, like a bear, a monster, or someone ten times bigger than her, so maybe I’ll just set this frog thing aside and work on that. I just got this inspiration and wrote about it. I wrote the story in about a day and a half. It was edited later on but I got pretty much everything down for the story and I did a bunch of sketches at the same time. I usually do some thumbnail sketches while I am writing to try to picture the action, the setting, and basically, you’d say in theater, the blocking, or the where the characters are in relation to each other. 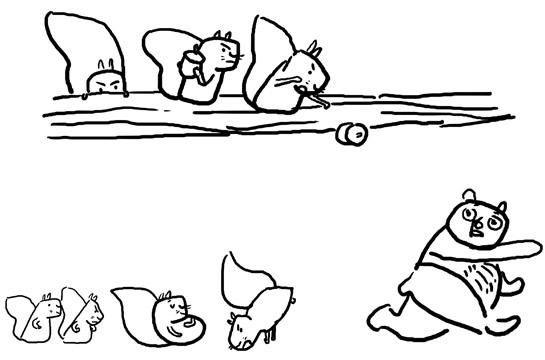 The cinematography of how the squirrel moves through the story. So I try to get some of that down when I am first having the inspiration and that ends up just in the margins of my sketchbook as I am writing. I get these gestural little sketches. I try to keep it pretty fresh so when I go to the final I don’t have too many steps from that initial gestural image to the final. P&O: How did you approach Penguin about your new story? Did you say I have this squirrel story so can we hold off on the frog story? David: I did, yeah. I had a two book contract with Penguin. It wasn’t really set in stone what the books would be but we thought frog book then owl book. 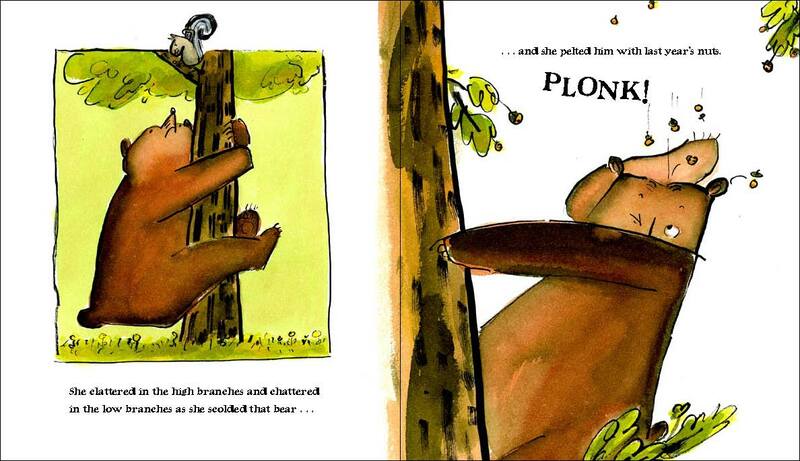 This squirrel book turned out to be a mixture of the frog book and the owl book in terms of the character. 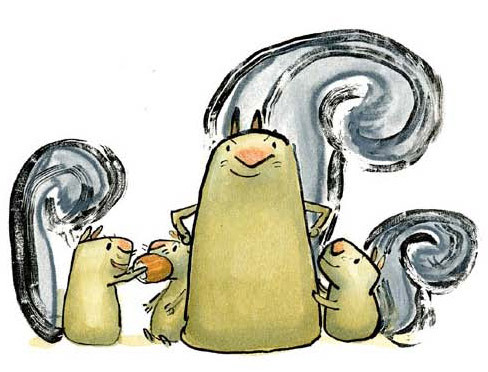 In the owl book there was this really overprotective dad character so that became mama squirrel in a way now that I think about it. At the time Penguin knew I was really fed up with the frog thing. They were cool about just taking this new story because it was fresh and exciting. I was excited it and the were excited about it. P&O: That’s so great that it just came out of you in a day and a half. It seems like the story was meant to be. David: Yeah it’s kind of related to what I was talking about at scbwi, when you just can’t make any headway with something it’s good to follow the spark. What makes you excited? What makes you want to play and calls you away from this thing that you’ve been banging your head against? And that’s where the good energy is. P&O: Do you think you’ll pick up the frog story again? Or is that to be decided? Maybe! It was a pretty funny story about co-sleeping but with frogs. P&O: So Penguin gave you the go-ahead. What was the next phase of your process? 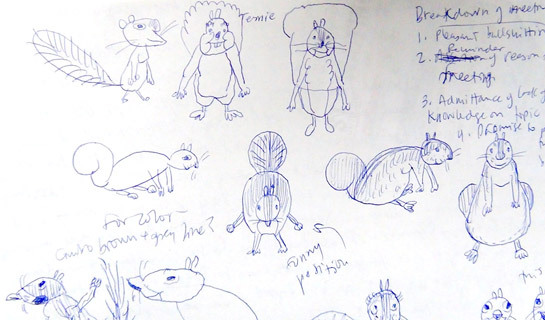 Did you draw a million squirrels and try to figure out your perfect squirrel? David: Before I did that, I drew the whole book out in a small dummy. I took half of an 8.5×11″ page and made that into a spread and folded it so I made an actual physical book. I just did it in black and green pencil and green marker. Then we worked on the story for a little bit. Originally there was a griffin in the story, a mythical creature, instead of a bear. David: I am kind of glad we took that out. P&O: Yeah that changes things around a bit! David: It was unecessary. But it was kind of cool. I just wanted it to be really over the top with this enemy that she had. 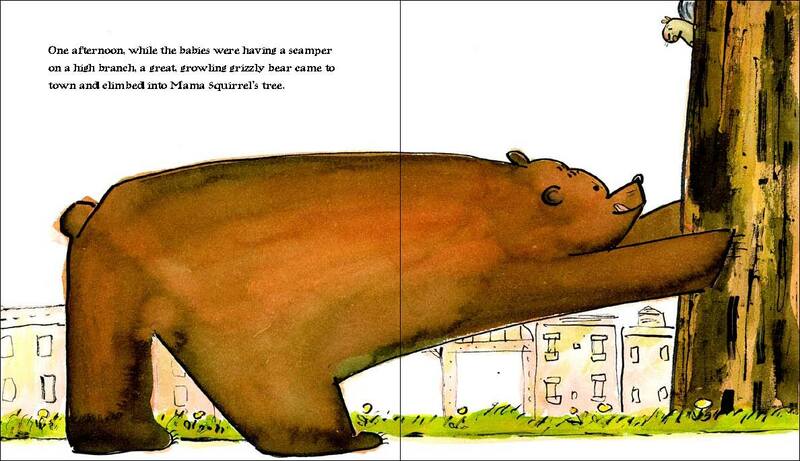 But a grizzly bear is fine because it’s an urban grizzly bear, kind of unexpected but kind of possible. It had to be sort of realistic but with a flexible definition of realism. All of the animals are real and they could potentially be in the same space together. After that dummy, I went on to start drawing the character, trying to get her to be the leading lady of the story. 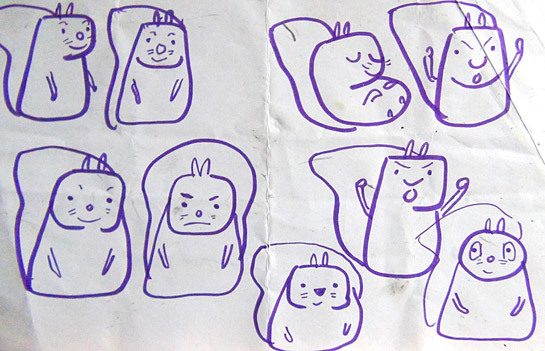 I probably drew 100 different squirrels. P&O: What was the process from creating the first batch of final artwork to realizing oh no this isn’t my squirrel? David: I created the first batch of final art the same way I did for Because Amelia Smiled and Interrupting Chicken. I drew in pencil directly on the paper then I started building up layers of crayon and paint so there was a lot going on. The original artwork had a lot of layers and it was holding the story back because of how much there was. There were more background elements and it wasn’t as simple as it is now. It was really like an exploratory step but then I was like, oh crap, I have to hand this in, so I just went with it. I did the whole book that way, with that character that wasn’t really the final character either. I thought, okay, this squirrel is pretty funny. She’s pretty good. I had to hand in the final art in a month and the art was taking a long time because it had all these layers. So finally I just shoved it all in an envelope and went to the publisher and I layed it out. My heart was kind of mixed. I was like, I wonder what they are going to say about it, but then I thought it doesn’t matter what they say about it because I don’t like it. 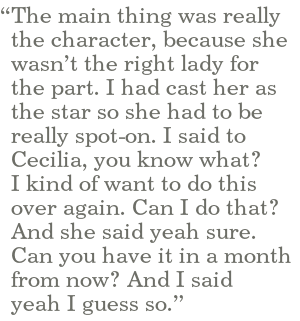 The main thing was really the character, because she wasn’t the right lady for the part. I had cast her as the star so she had to be really spot-on. I said to Cecilia, you know what? I kind of want to to do this over again. Can I do that? And she said yeah sure. Can you have it in a month from now? And I said yeah I guess so. Some color character studies for the original Mama. I decided to do it really simply the second time. I went back to the dummy and I redesigned a lot of the spreads to make them very simple and took out all of the extra background, like joggers and litter and stuff. This was something that should have happened the first time but I didn’t push it far enough. It was almost like I was picking up where I left off and continuing to distill the book down to something more simple. I went back and I did 100 more squirrels until I go the right one. I mean squirrels are kind of tough. I was talking to Daniel Salmieri about it, the guy who did Those Darn Squirrels! 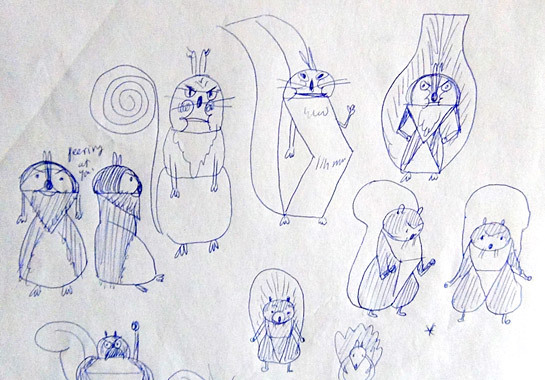 We were talking about squirrel design and he was like yeah it was really rough. I forget what he said, I think he had to flatten their heads to make them work. P&O: Why do you think they were hard to draw? Was it hard to make them feel cute or expressive? 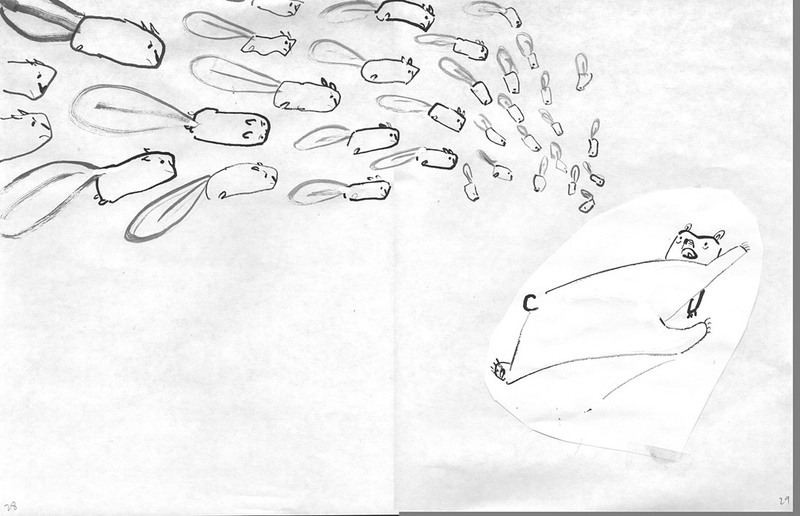 David: For me it was to hard to make them feel simple but still make them feel like squirrels. I was trying the give them a round nose and my wife was saying, no, no, they have to have that “V” nose. Otherwise it doesn’t look like a squirrel. I kept trying to give them a small nose. She said squirrels have big noses! So I said fine. I’ll do the big nose. But then I took some liberties with the rest of the body, making it really tater tot-like, like a periscope shape. You don’t even see their feet most of the time unless they are running or something. I just wanted to make them really cute. Like a nugget. Like something you would want to hold in your hand. I had to distill down until I hit the bottom of the design limit where you don’t have too much but you don’t have too little either. It still had to feel like a squirrel. Once I go that character everything flowed out of her. I was like yeah this is a great character. It makes me happy. She’s funny, the babies are cute. Everything exploded from that good design into the rest of the book. P&O: Did the words change at all once you redid the drawing? David: I don’t think they changed at all, maybe a couple of words here and there. But it was basically about getting the art to step aside and out of the way of the story. Making the art of the story more transparent so the story could show through without any hinderance. That was really what I had to do. So yeah I am happy with how it turned out. P&O: It’s great! And so, was Penguin happy? David: They were so polite! I could feel some tension when I brought the first finals in and that’s what encouraged me to say, look, I want to do it over. But the second time they were so thrilled about it and I could tell they really loved it. They were relieved that this is the book we ended up with. The designer did a really great job too. I love the type. Do you have a say in the type at all when it comes back to you? David: Yeah I do. They usually say something like, this is what we like. Do you like it too? And I usually say yes. For the title, it’s almost very Hanna Barbara-ish so I love that. Kind of like a funny old cartoon. P&O: For the second round of artwork, how did you go from your sketches to finals? David: I usually redo the drawing for the finals and go from pencil to some kind of ink. I do the ink differently each time; I want to keep it really fun for me. For some of my books I’ve actually used a thick china marker, which is just like a big pencil basically. With Pouch and Interrupting Chicken I used this grease pencil. But a lot of the time I just use ink and I’ll use a different kind of brush. 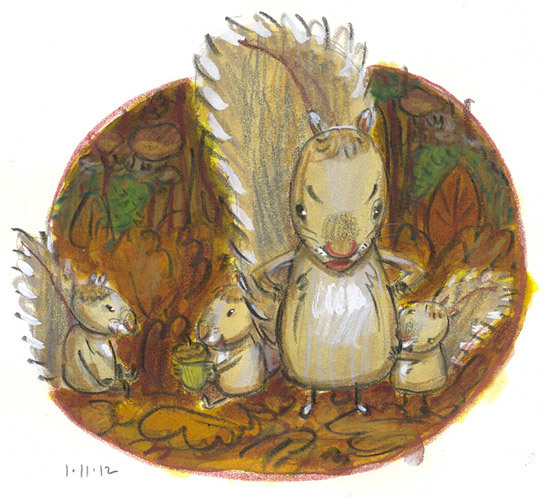 For Ol’ Mama Squirrel I decided to take a number two pencil and just dip it in the jar of ink and draw. All the line work is done that way. I had to do the thick lines first and then go thinner as the ink was used up. Once I completed the black and white ink drawing, I photocopied that onto watercolor paper and then I added different colors. I messed around with all different ways of painting—different palettes, different kinds of watercolor paper, hot press, cold press—especially in the beginning. To keep the drawing really fresh I like to be able to keep photocopying the same drawing over and using it with different paint techniques. LEFT: An illustration from the first batch of final art. RIGHT: The new artwork as it appears in the book. 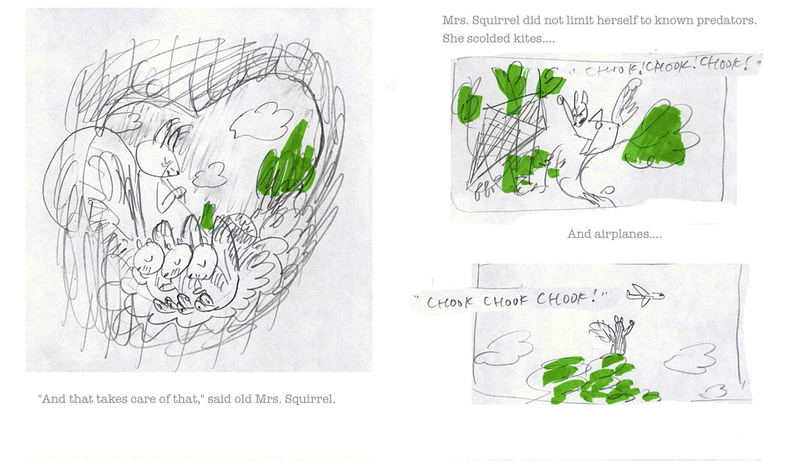 P&O: So for Ol’ Mama Squirrel all of the black line work is pencil dipped into ink? David: Yes, except for the tails and the trees that have these softer, brushy lines. Those are actually made with a brush that I found that was an old makeup brush. It had an angle to it and it was very small and I used it as kind of a fan brush to make the tails fluffy and to make the bark texture. And I also used the side of the pencil to make the bark by rolling it back and forth on the paper to get thick lines and scratchy lines. P&O: It sounds like you like to use crude materials to keep you loose. David: Yeah and it really slows me down because I have to think about how much ink I have on the pencil and when it is going to run out and when have I found the balance and the right thickness of line. It’s almost like a meditation for me because I can tend to go too fast if I have a regular pen that is easy to use. I like that meditative quality of hampering yourself to some extent, to have a more creative outcome. I also like doing something totally different from the sketch because the sketch was just pencil. It almost feels like I am doing it totally from scratch when I go to the ink. P&O: That’s so interesting to hear that you are looking for something to slow you down because I think of your work as so gestural. David: It is really gestural. I need to slow it down by about 20 miles and hour so I can plan the next line. I love that moment of dipping into the ink when you can look at the picture and say, hmmm, what’s the next line going to be? I need that pause of contemplation in there. 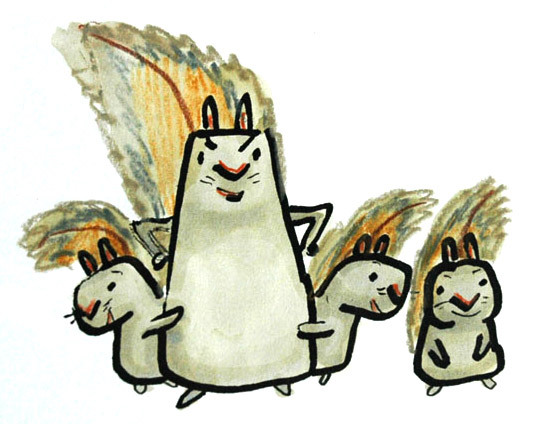 Various Spreads from Ol’ Mama Squirrel. P&O: What are you working on now? I just finished Dinosaur Kisses for Candlewick (Fall 2013) and now I am working on a middle grade novel so I am trying to figure out how to do that. It’s a whole other process. Do you have a typical day? Do you try to set a schedule for work? David: I work in a studio in my apartment. I don’t really have a typical day but I have typical things that I try to do in a day in some order. I always write three pages of stream of consciousness every day, morning pages basically. I always do some kind of exercise and I always try to make some kind of music every day. I’ve been making my own schedule for about twelve years now and it is really an art form in itself. It’s kind of an improv every day to some extent but I’ll make a list of the things I really want to get done and then I can usually do most of it. P&O: Do you show your work to people as you are working on it to check in? David: I show stuff to my wife all the time and she always tells me the truth about it. If she doesn’t like it something must be wrong with it. The main thing is you don’t have time. You come out with something, you make it, and then you are like is this good? I don’t know. I mean it’s good for right now but what am I going to think about it in a week from now or a month from now, or five years from now? It’s really hard to get that perspective right away when you’ve just made something. That comes in really handy and I kind of wish I worked in a studio with other illustrators. I have some friends I can send stuff to digitally. But really I know my wife is going to tell me the truth; that’s really all you need, someone who is really honest about these things. And she’s not going to take any nonsense about anything if I try to explain it or something. P&O: I love the list of influences you gave us earlier, can you tell me more about the artists and illustrators that have influenced you? David: I am mostly influenced by more traditional artists like Matisse or Degas. I am influenced by lots of Japanese woodblock work and calligraphy, especially for the black line. I love African sculpture. It’s considered primitive but I actually think it’s very sophisticated, beyond western art, because of the distillation of forms. It’s representational a lot of time but it’s just so far from what things actually look like that there’s this huge spiritual component to it. It’s the essence of something so that’s what I always try to do in my own work: find the essence of a squirrel or the essence of a dinosaur visually speaking, and to also find the essence of an idea in the writing. And the essence of emotions in the story telling. In terms of picture book people, Uri Shulevitz is one of my favorites right now: Snow and Dawn. I love the essential quality of his work and his technique is great. 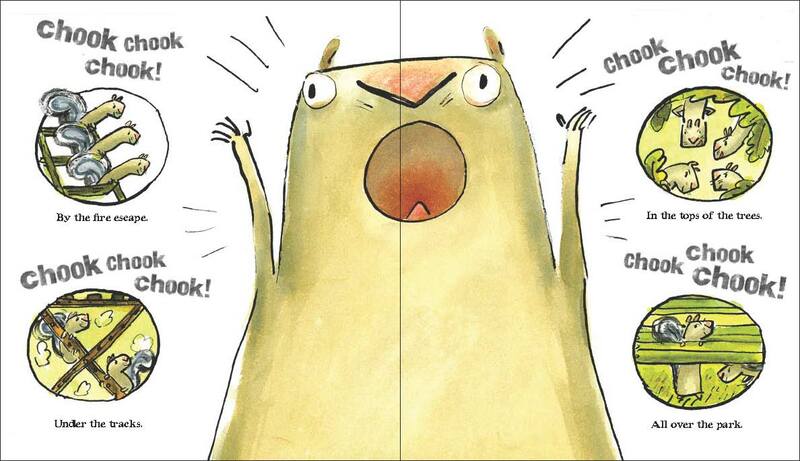 I like pretty much anyone with a lot of line like Steig or Arnold Lobel. Lobel is a huge hero of mine for writing and drawing. So all these guys I read as a kid. Dr. Seuss was probably my favorite when I was a kid. And I love the book Ox-cart Man for the sense of place and the way the style tells about that time period. The writing makes me cry at the end because I wish I could have that life where I make my own honey and stuff. It’s just so perfect and it makes sense! It’s a meaningful life. It’s a very universal desire and the art reflects it perfectly. I also love Calvin and Hobbes. Bill Watterson was one of my main influences, the way he draws with a brush. That was ingrained in my mind when I was ten or eleven, his expressive brushwork and his writing too. It’s truthful to his world view and also really funny and goofy at the same time. P&O: If you weren’t an artist what would you be? David: I always wanted to be film director when I was a teenager. Or I would be a broadway actor/singer. I am definitely closeted in that way. I want to be on stage and have attention. I love singing and I just love the funny lyrics and situations; it’s like an extension of what I do anyway. I’d like to write some musicals at some point. That or maybe portrait artist too. I am doing a trailer for Ol’ Mama Squirrel that has a bluegrass song that I wrote. I am actually going into Penguin because they have a sound studio there. We are getting a banjo player and we are going to do a song about Ol’ Mama Squirrel, so that’s like my broadway. Maybe I’ll dress up as squirrel and pretend to play the banjo. Thanks so much David for sharing your story with us. We can’t wait to see what’s next. Check out more of David’s work on his website. 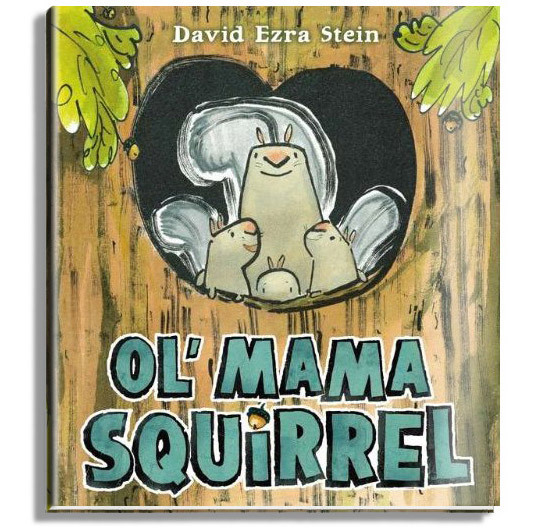 And here’s that Ol’ Mama Squirrel trailer with an original David Ezra Stein song (but alas no squirrel costume). This is sooooo wonderful to read. Thank you!!! Thanks Lori! I had a great time talking to David and putting it together. Excellent interview, thanks for this!